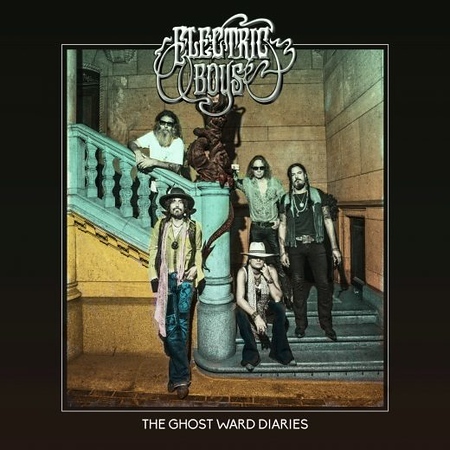 “The Ghost Ward Diaries” is the sixth album from Swedish band Electric Boys and their third since reforming in 2009. It was released by Mighty Music on 23rd November. The band who are probably best known for the hit single “All Lips ‘n’ Hips” will be playing The Diamond Rock Club in Ahoghill on 23rd March as part of the tour to support the release of “The Ghost Ward Diaries”. I included the single “Hangover in Hannover” on the Friday NI Rocks Show on 23rd November. Electric Boys formed in Stockholm in 1988 and recently the highly acclaimed debut album “Funk-O-Metal Carpet Ride” in 1989. That album was produced by Bob Rock and included the hugely successful single “All Lips ‘n’ Hips”. The second album “Groovus Maximus” was released in 1992, followed by “Freewheelin” in 1994. The band split up shortly after that album. In 2009 all the original members of the band came back together to reform Electric Boys – Conny Bloom on lead vocals and guitar, Andy Christell on bass, Franco Santunione on guitar and Niklas Sigevall on drums. In the interim Bloom released some solo material and he and Christell were also part of Hanoi Rocks for a few years ahead of that band splitting in 2009. Electric Boys released their comeback album “And Them Boys Done Swang” in 2011, followed by “Starflight United” in 2014. Since reforming the band have opened for Metallica, Alice Cooper, Mr Big and others and performed on the Monsters of Rock Cruise in 2017. The new album includes additional drumming form ex Hanoi Rocks drummer Jolle Atlagic who replaces Sigevall on some tour dates as the latter is based in LA.